Mike @CincyKidPoker adds an HPT title to his poker resume, taking home $95,470 for closing out the Belterra Main Event and also receiving a $3,600 championship package to the 2017 HPT Championships in December at Ameristar St Charles. 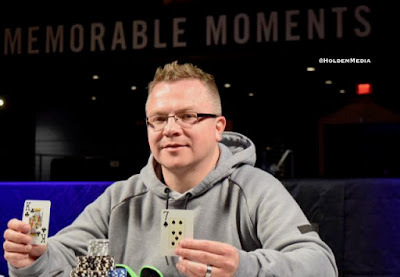 "It was a super tough final table, I am super happy to win this, to get heads-up against Adam and win that one big hand to propel me back to the chiplead." That big hand was a flip for stacks, AQ > KJ with nearly 9,000,000 chips in the middle. Scarborough held and took down the title a few hands later. 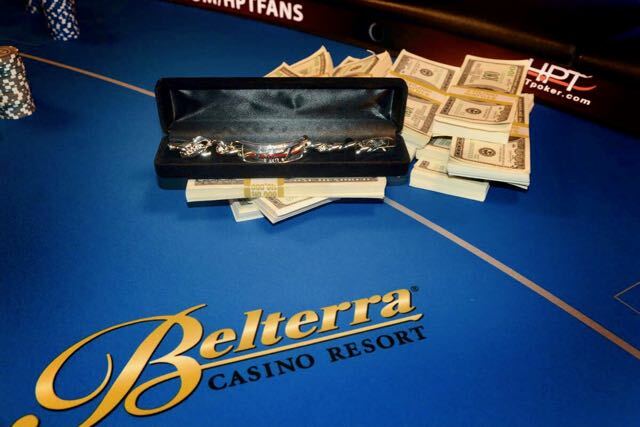 a Belterra HPT record field of 436 entries took a shot at the title, 45 made the money and Scarborough now has both HPT and WPT titles to his name. 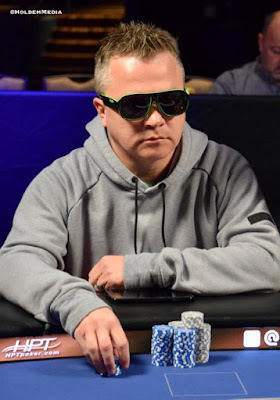 Mike Scarborough has opened up a good-sized chiplead heads-up against Adam Stephens, who is down to fewer than 20BB to start the hand. Both players keep the action going on the flop and the turn. Stephens snap-shoves his remaining chips on the river - the board showing three 8's - and Scarborough snap-calls, turning over for a full house. Stephens shows and Stephens finishes in second place, earning $58,943. "Before the final table started, my buddy gave me some advice and that was stay away from Scarborough," Stephens said in his postgame interview. 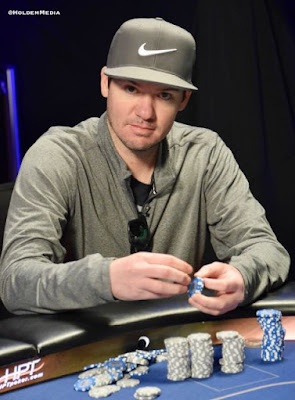 Adam Stephens opens to 500,000 and Mike Scarborough (above) 3-bets all in preflop for 4,335,000. Stephens asks for a call, seems anguished over the decision, pulls out two stacks of brown 100k chips for the call, as this would flip the stack if he loses the hand ... and he finds the call. Folks on the LiveStream have to guess the cards as Scarborough's didn't show up preflop. 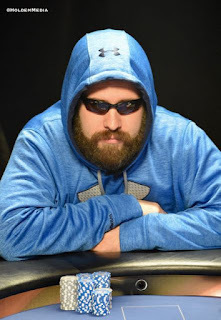 One hand after losing his chiplead to Adam Stephens, it is Kurt Jewell moving all in preflop for 12BB. Stephens asks for a count and makes the call. The board runs out and Stephens eliminates Jewell in third place, a $39,226 cash. Adam Stephens opens, chipleader Kurt Jewell 3-bets all-in and Stephens calls off his 2,870,000 stack on the flop. Both players hit top pair, Jewell is behind with the weaker kicker. 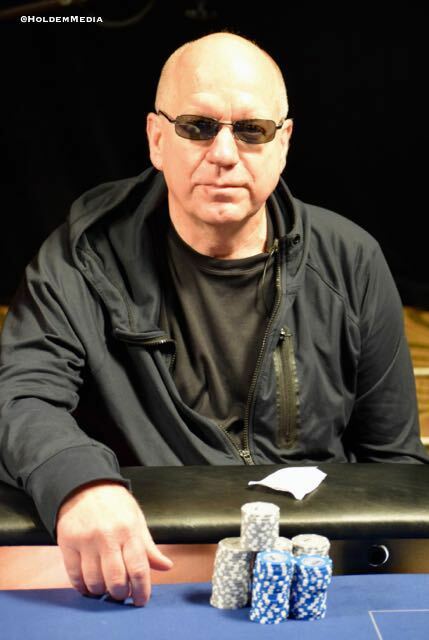 Jeff Maiden moves all in and WPT Champions Club Member Mike Scarborough snap-overshoves to put Maiden at risk. The board runs out and Scarborough scored the knockout, Maiden finishing in 4th place for a $27,188 cash. Barb Walson moves all in UTG for 1,095,000 and Mike Scarborough calls, placing Walston at risk. 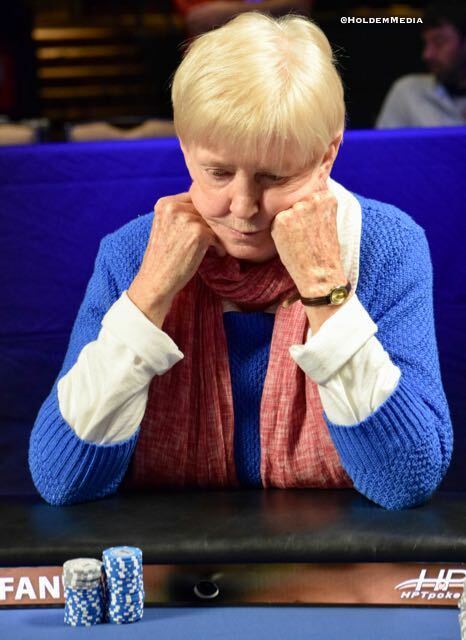 Both players hit the flop, with Scarborough moving to the lead. The board runs out and Walston is eliminated in 5th place, cashing for $20,547.